Perfect Teeth - How To Get Great-Looking Teeth! Most people would like to have perfect teeth. Unfortunately many of us are born with teeth that don't look quite the way we'd like them! Also, sometimes the appearance of your teeth can suffer from effects such as "antibiotic staining", if you had to take tetracycline when you were a small child. Sometimes we start out in life with great teeth, but have some sort of accident or trauma that affects how our teeth look. I think it's possible for anyone to have nice teeth, but sometimes we need to make a few changes first. This is how we might all like our teeth to look - white, glossy, straight and even. But these are not "natural" smiles - these teeth started out discolored, dull, and crooked. I was able to improve their appearance to what you see here by using some of the techniques described below. Here's my guide to the things that affect the appearance of our teeth look when we smile, and how you can change each of these things to make an improvement. Tooth color. The most common "fault" - and the most easily fixed - is teeth that are darker or yellower than we would like. Everybody thinks of perfect teeth as being very white. While teeth that are TOO white can look fake, there's no doubt that a lot of us would like to lighten up our teeth to some degree. Tooth whitening is a safe, reliable and effective technique for improving dull or discolored teeth. It is possible to get tooth whitening "in an hour" at a dentist's office. However, I think that you get more reliable and longer-lasting results by using a take-home system. You can read more about this at best teeth whitening products. Tooth texture. The "texture" of a tooth is a description of the surface smoothness. 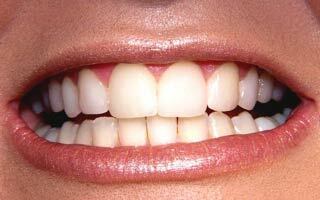 Ideally, we all like the look of teeth that have very smooth, glossy enamel surfaces. They look shiny! If your teeth have uneven or rough enamel, they can look darker than they really are, and don't look glossy. While dark teeth can be made lighter with tooth whitening techniques, the only way to improve rough or pitted tooth enamel is to cover it with something. That usually means veneers or "porcelain laminates". If the enamel is only slightly pitted, it may be possible to polish down the enamel surface a bit. This usually gives some improvement, but is usually NOT a 100% solution. For the appearance of perfect teeth, you will need to think about getting veneers from a cosmetic dentist. You can read more about veneers at my page about Cosmetic dentist veneers. Tooth shape. Sometimes your teeth are white enough, and have smooth and glossy enamel, but you don't like the shape! Maybe they are a little too long, or too square, or they are worn down and are too short. Again, small problems can sometimes be improved by re-shaping the teeth a little. It may be possible to straighten out uneven tooth edges by polishing down the enamel at the tip a bit. A tooth that is too long may be shortened by 1 to 2mm by careful adjustment. But any more than this calls for more involved treatment. The usual option for improving tooth shape is crowns ("caps") or veneers. Tooth position. There are really 2 issues here. If your teeth are quite irregular and closely packed together, then your only option is orthodontic treatment with braces.But if your teeth are spaced out, and you don't like the gaps between the teeth, you have another option in addition to getting braces. Read more about this at Gap in Front Teeth. Too much gum. One other situation that might arise involves how much gum you show when you smile. Your teeth may be quite white, straight and glossy, but you may feel self-conscious if you tend to show a lot of gum when you smile. There are 2 options here. It may be possible to improve the appearance of your smile by reducing the amount that your upper lip rises when you smile. This can be done with Botox, but it needs a skilled and experienced dentist or plastic surgeon to get it right. The other option is a "gum lift". For this procedure, a dentist can raise the level of your gum line so that less gum is on show when you smile. If it is only 1 millimeter or so, the procedure can be fairly straightforward, and many dentists who do this treatment will use a laser. If you really need to raise the gum line more than 2 millimeters, then you're probably better off getting treatment with a gum specialist, also called a "periodontist". Make sure he's Board Certified in your state or region, and ask to see photos of his previous treatments on other patients! Your own general dentist can probably refer you to a periodontist that he trusts. As you can see, there are several aspects to look at when thinking about perfect teeth. 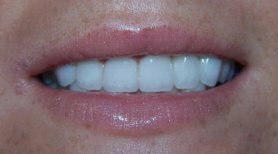 Sometimes, it's possible to make some simple changes by tooth whitening, cosmetic re-contouring and composite bonding. Other times, to make a significant change will require more involved treatment. Creating nice teeth can be quite complicated. Ask your dentist for his opinion, and maybe think about getting a second opinion too! A useful website with a guide to perfect teeth and a list of cosmetic dentists can be found at American Academy of Cosmetic Dentistry. To find a cosmetic dentist in your area, just click on the yellow/orange button at the top right of the AACD website. It's labelled "Find a Dentist". I strongly recommend the Cybersonic 3 sonic toothbrush. I think it has the best performance of any brush I've tested, and you can get it at a great price (50% off) if you use my discount code on Best Sonic Toothbrush.